Basswood (Tilia americana) is one of the largest trees in eastern north America. It can be found in cool, moist, deep soils from Southern Manitoba to New Brunswick and south to Missouri, Oklahoma, Kentucky and Delaware. It grows at elevations below 3200' in its northern range and between 3000 and 5000' elevations in the southern Appalachians. Tilia americana has a deep and extensive lateral root system, supporting trees that can grow 70 to 80' tall with a 2 to 3' diameter. The largest Tilia americana is growing in Montgomery County, PA and is 94' tall and has an 8' DBH. The trees have an oval to rounded crown, and mostly have one continuous, straight bole. The canopy is very dense, creating deep shade. The extensive root system is known to improve the soil it grows in by absorbing nutrients deep in the soil and then depositing those nutrients back into the topsoil as its leaves decompose. Basswoods are known to sprout vigorously which is why the trees are often found in close proximity. They are not fire-resistant, but a forest fire will not kill them, it will just force them to re-sprout. 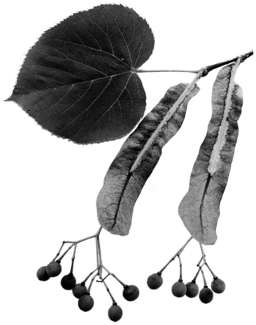 The basswood's large leaves are alternate, to 5" diameter and 8" long, unevenly heart shaped, dark green and smooth above and paler with scattered hairs below. Basswoods are not notable for fall color, though some trees turn yellow. The cotyledons of basswoods look nothing like their adult foliage. 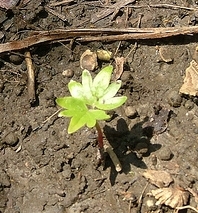 The two cotyledons are deeply palmately divided, and carpet the forest floor in spring. Leaves have been historically used as food for humans and livestock. One of the most important trees for honey production, basswood flowers when the leaves are mature, usually in June here in the Finger Lakes. 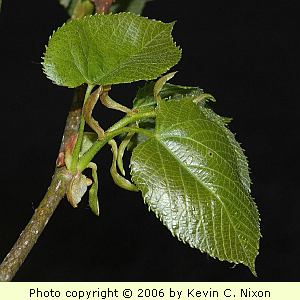 In flower, basswood is often found by listening to the buzz of bees collecting nectar from its blossoms. The fragrant yellow to white flowers grow in clusters and are subtended by a narrow, green, leaf-like blade. Basswood fruits are 1/3" in diameter, globose, nutlike and have a hard outer shell with a small seed. The fruits remain attached well into winter, and are one of the easier ways to identify this tree. I had been walking past a filled in kettle hole for years when one winter I noticed the fruits of Tilia on the snow about 100' away which led me to find one of many large basswoods close to my home. Trees produce seeds starting at about 15 years and have been known to continue fruiting yearly for up to 85 years. 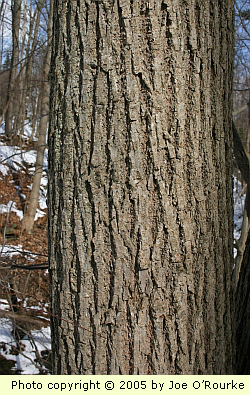 Tila americana bark is a very dark brown with continuous, narrow ridges going up the tree. Young bark is smooth and grey, dark green or red (the ones I looked at this weekend were all red) with long lenticels. The twigs are zig-zagged and don't have a terminal bud. The lateral buds are .2 to .25" and have two visible red scales, which are lopsided and mucilaginous. Tilia bark (both the European and North American species) is the best woodland source for rope, string, thongs or strips for sewing birch bark. To get the fibers to make into rope, the bark is soaked in water for two to four weeks until the fibers separate. Tilia wood is well known for its carving properties. It is also used in furniture making, though it is then covered with a veneer of other woods. Historically the wood was used for pulp in early paper production.